On calm days with calm seas sound travels across water, bringing bellows and roars to our ears as the Steller sea lions hauled out on a rock a mile or so away make their presence known. Sometimes one of us is compelled to "speak" back to them across the distance. It's spring here and that means every form of life is waiting for the herring to arrive, to feast on the six-inch long, 200-gram herring ready to spawn. We know the sea lions use those calories and we would like to get a few ourselves. Perhaps if they spawn in Village Islands this year, we can collect some kelp with roe on it for a delicious spring meal. Our favorite way is to take fresh herring roe sacs and lightly boil them in salty water for 5 minutes until just cooked. The texture and taste isn't far from shrimp, mild with that little pop on the first bite. Since it's still too early for the herring, and one never knows where they will spawn anyway, we, as well as the sea lions, wait. One recent day when we were in the skiff anyway on a mission to collect beach peat from Uganik River as compost for our garden, we decided to pay these blubbery neighbors a visit, keeping a respectful distance. That these marine animals, graceful and swift underwater, manage to heft their bulk (males can be almost 2,500 pounds, while females grow to be 1,00 pounds) onto tufts of shale boulders jutting up from the ocean is a testament to their incredible strength. We marvel and photograph them, no plexiglass windows or chain link fences separating us while we share the environment around us. Not wishing to disturb their rest, we leave them to their outdoor perch to catch more sun while day dreaming of tasty oily herring. And then there are the human neighbors, much quieter but still a pleasure to visit. In this little corner of the world, we can count 2 families and 3 individuals who reside here year round. A day or two after our visit to the sea lions, Tollef brought the old-timers who live a walk away some birch water from our trees (read last spring's post about the birch water), garden mint, and newspapers. He came home with 2 pieces of leftover salmon servings for our lunch. 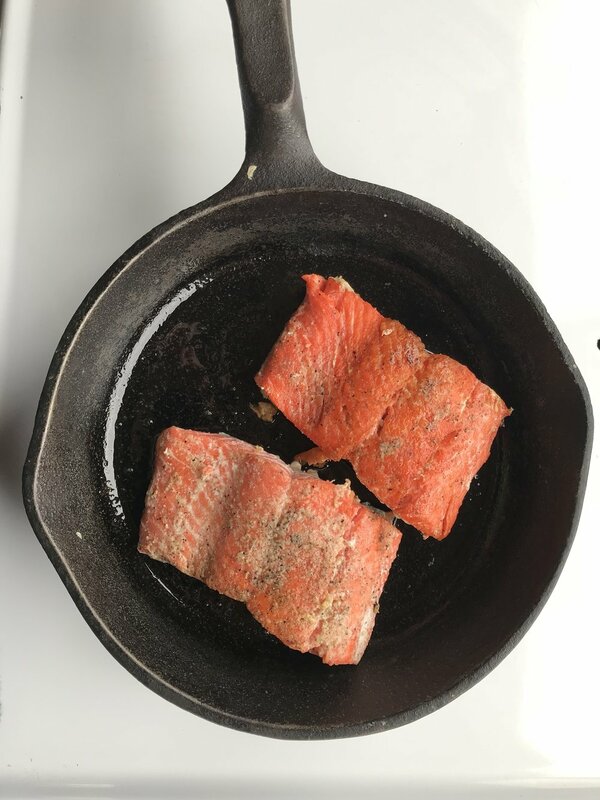 Ironically, though we sell our lovingly-caught salmon from summer through late winter, we do not keep a freezer connected at our house when we are gone in the winter, so springtime leaves us without any fresh frozen salmon. The salmon we eat in spring is all our own canned salmon we put up last fall. We relish that, but it is an unexpected joy to remember the clean taste and beautiful, almost astonishing, bright red color of Uganik bay sockeye fillets. This humble gift of home and of place fed our hearts just as much as our muscles. How lucky we are to be able to live among such neighbors.